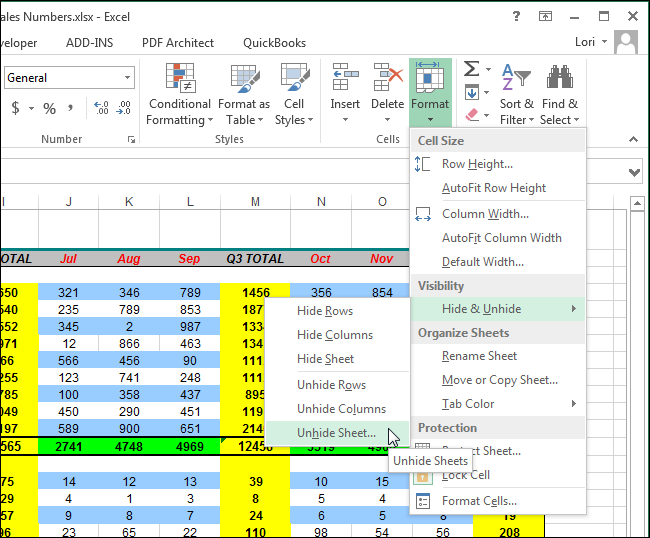 If you use a worksheet in your Excel workbook to hold values or formulas referenced on other worksheets, you may not want that worksheet visible on the tab bar at the bottom of the Excel window. The good news is you can easily hide worksheets in Excel. You can even hide an entire workbook, although we’re not sure why you would want to do that. However, we’ll show you how to hide worksheets and workbooks and show them again. 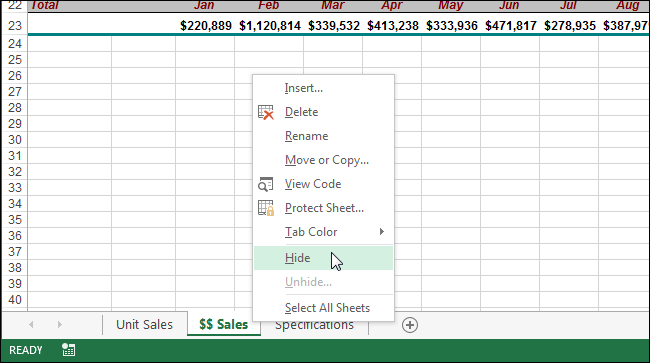 To hide a worksheet (the tabs at the bottom of the Excel window), right-click on the tab you want to hide and select “Hide” from the popup menu. The tab is removed, but not permanently deleted. You cannot hide all the worksheets in a workbook. If you try to hide the last visible worksheet, you’ll see the following warning. To unhide a worksheet, right-click on any tab still showing and select “Unhide” from the popup menu. On the “Unhide” dialog box that displays, select the worksheet you want to unhide and click “OK”. NOTE: You can only unhide one worksheet at a time. If you’ve hidden the worksheet tabs to make more room to view your worksheet data, you can unhide hidden worksheets using a different method. Make sure the “Home” tab on the ribbon is active. In the “Cells” group, click “Format”. Select “Hide & Unhide” under “Visibility”, and select “Unhide Sheet” from the submenu. The “Unhide” dialog box displays. Select the worksheet you want to unhide and click “OK”, as described above. To hide an entire workbook, click the “View” tab. In the “Window” section of the “View” tab, click “Hide”. The Excel window stays open but the grid area becomes blank. 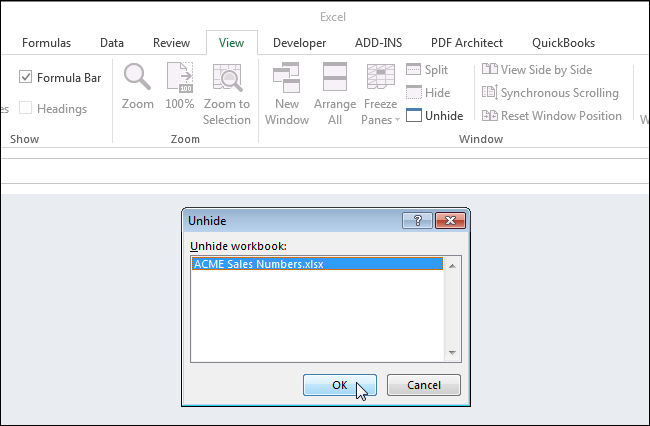 To unhide the the workbook, click “Unhide” in the “Window” section of the “View” tab. The “Unhide” dialog box displays listing the filenames for the currently open workbooks. If you have hidden other entire workbooks that are not current open, they are not listed in this dialog. When you hide an entire workbook and save the file, the next time you open the workbook, it’s still hidden. It will remain hidden until you unhide it. NOTE: Any worksheets/tabs that were hidden when you hid the entire workbook are still hidden when you unhide the workbook.